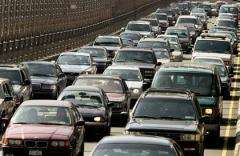 (PhysOrg.com) -- Two studies have just been published that may help improve traffic flows. The first, presented as a Santa Fe Institute working paper for September, concluded that if traffic lights responded to measured traffic flow instead of being timed. The second, published in a special edition of Philosophical Transactions of the Royal Society, looked at how driver behavior affects traffic flow. Traffic congestion is a growing problem globally, and minimizing it would save money and cut emissions, as well as reducing stress and frustration in drivers. Traffic lights are usually controlled by an "optimal" timed cycle maximized to suit an expected flow of traffic for the time of day, but the problem is the large variability of traffic volume and the direction vehicles travel on leaving an intersection even on a “typical” day. This can lead to gridlocks or traffic congestion if too many vehicles are made to wait too long, and to frustration if drivers are made to wait at red lights when no vehicles are present on the intersecting road to take advantage of the green. Co-author of the first study, Dirk Helbing of the Swiss Federal Institute of Technology in Zurich, said the current method of top-down control is not optimal because the average situation for which it is designed rarely occurs. With colleague Stefan Lämmer of the Dresden University of Technology, Helbing studied crowd movements through a narrow space and discovered a natural “traffic light” develops with many people from one side moving through the space and then the flow reversing suddenly and those waiting at the other side moving through. Helbing said the natural movement oscillation is the result of build-up of pressure on the side where people are waiting, and they wondered if the same principle could be used to control traffic, so the traffic flow controls the light rather than the opposite. They ran a simulation in Dresden city center, fitting two sensors to each traffic light to detect incoming and outgoing traffic flows. Each traffic light communicated only with its nearest neighbors, so that “platoons” of vehicles could be detected in enough time to give the next set of lights time to prepare and avoid stopping the large number of vehicles. The area covered in their experiment included 13 sets of traffic lights, 68 pedestrian crossings, seven bus and tram lines crossing the network every 10 minutes, and a train station handling over 13,000 passengers a day. The results of the experiment showed traffic flow was improved for all vehicles and pedestrians, with trams and buses spending 56 percent less time waiting in traffic, other vehicles spending nine percent less time stuck, and a 36 percent reduction for pedestrians. Adopting traffic light systems that improve the flow addresses only one part of the problem because vehicles are driven by humans and their behavior can have a significant effect on traffic flows. The second study found that drivers who are too aggressive are a major cause of traffic jams, because of their habits of driving too fast, tailgating, and frequently slamming on the brakes. Timid drivers also cause traffic to slow because they leave too big a space in front of them and “send a wave of deceleration” behind them. The paper’s author, Dr Jorge Laval, of the Georgia Institute of Technology in Atlanta, said "stop and go" driving behavior is a frustration for drivers, which affects safety, and it increases fuel consumption and emissions. With colleague Ludovic Leclercq of the University of Lyon in France, Laval studied traffic on stretches of freeway in Los Angeles and near San Francisco, and then created a mathematical model to match their observations. Their results showed that changes of speed passed like a wave backwards through traffic, and the slowdown was worsened by aggressive drivers, who kept too small a gap between vehicles, causing them to frequently brake hard at the last moment and then drive more slowly to open up a gap. Traffic speed also slowed with timid drivers, because they deliberately drove even more slowly to increase the gap between their vehicle and the one in front. The responsive traffic light system will soon be implemented in Dresden, and Zurich is also considering adopting the system. Laval and Leclercq suggest the driver behavior problems could be addressed by an increasing use of adaptive cruise control (ACC) that can keep the gap between cars at a set distance. Seems to me when a traffic light breaks and the lights go to flashing red and yellow, traffic flows quicker in both directions. "the current method of top-down control is not optimal "
That is so true for so many applications. Tucson designed the lights on 22nd Ave to allow one to drive non-stop. Lagging left turn signals are also a good idea. I liked the traffic circles with no stop lights. To be effective, they must be large. You mean you like rotaries, which are one of the most dangerous traffic designs ever conceived. The most efficient method is fixed time period coordinated flow. Theoretically, once you joined a queue you would never have to stop. There is no reason to change signal timing once coordinated flow is achieved, if it can be achieved. Coordination depends on adequate spacing of signals, which rarely occurs. The coordination of traffic flow is very valuable to explore requirements and solutions. Simulation studies are a great tool to explore the options. I am excited by this, Timed stoplights are outdated. Why would a stoplight be green when there are no cars? Who cares if there are cars there at other times, the only traffic that matters is the traffic that is at the light at the time. I have a friend that lives off of a left turn from a stoplight, and that stoplight will take 10 mins to let him through, when there is no traffic on the main road. Rediculous. Timed Stoplights = STUPID. Sensing stoplights = SMART. It is my belief that much can be gained if during off peak hours the following was implemented. Traffic lights at intersections where high meets low traffic roads should switch to flashing red for the low traffic road and flashing yellow for the higher traffic road. They did this in my home town but only late at night. I get enraged when the light changes and I have to stop and sit through a red light when there is no traffic crossing. Typically the only car on the cross road arrives just in time to stop as I get a green light. I saw an article here not to long ago that said remove all the signs, paint stripes and traffic lights an accidents and congestion go down. Unfortunately too many believe that we need machines to protect us from ourselves. IDK, but this article likes roundabouts. No they are the same. Rotary is an American colloquialism. So better or worse depends on what you are driving. "A traffic circle or rotary is a type of circular intersection"
"Traffic circles should not be confused with roundabouts, in which entering traffic must always yield to traffic already in the circle, and generally operate at much lower speeds." "The experience with traffic circles and rotaries in the US was almost entirely negative"
"until the development of the modern roundabout in the United Kingdom during the 1960s". Now look up either roundabout or rotary on wiki and watch the two terms be defined as synonyms for one another. This is why wikipedia is not a reference. The Wikis which define roundabouts and rotaries as being synonyms are misleading. Maybe in colloquial speech they are used indiscriminate, but not among traffic engineers and scientists. Well as a layman when it comes to traffic research I must defer to your definitions. I had always been led to believe they were one in the same. Appears they are merely similar in appearance.